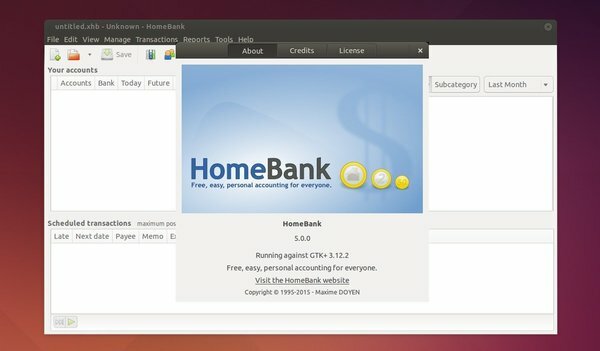 HomeBank, a free personal finance software, was finally ported to GTK+3 by releasing version 5.0. Here’s how to install or upgrade it in Ubuntu. Besides being migrated to GTK+ 3, HomeBank 5.0 also brings new reworked icon set, new stack chart for budget report, added a file statistics dialog, reworked and refactored import process to ease import, and some bug-fixes. For the details, see the changlog. While Ubuntu repositories provide an old version of this money management software, Ubuntu 14.04, Ubuntu 14.10, and Ubuntu 15.04 users can install/upgrade to the latest version via official HomeBank PPA.